Being a coach for any sport can be fun and rewarding, you can assemble (or sometimes inherit!) a team, and with that team grow, face adversity, and experience success as their leader. You can have an incredible impact on the lives of your athletes, but it is challenging work. When you coach football in a youth league, the level of difficulty becomes even higher. You must serve as a positive role model for the kids, motivate them to succeed, and make the game and your practice sessions fun so as not to sour any potential young athletes to the prospect of continuing sport as they grow older. That last part is tricky, as you have to balance keeping your players focused and disciplined while making the sport engaging and allowing them to have fun. You also have to take into consideration the fact that for most kids, especially nowadays, winning can come secondary to having a good time. You certainly want to push them to do a good job, but they aren't going to have the same motivations as adult players. They're not even going to have the same motivation as college or high school players. Teaching the game of soccer to kids is an entirely different task, and takes a particular personality and skills. You have to make sure you define success as making progress and improving skills. Otherwise, kids can become discouraged and quit, as they'll begin to see themselves as failures if it's always about having the best score (and they're consistently on the losing end of that equation). Unfortunately, not every coach is up to the challenge. There are those who fail to respect their kids, fail to appreciate the game, and put winning at such a high premium that they ruin the experience for many. There are others still who through incompetence and a naive "coaching is easy" attitude spoil the sport for youngsters by failing to introduce them to it properly. 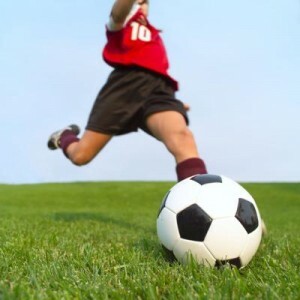 It is with these factors in mind that we present you with some excellent soccer coaching ideas for engaging and fascinating kids with the game. What's the secret to making things fun? In general, you'll have to turn learning how to play the game into a series of games all their own. Kids get bored easily, and trying to get them to stay on target with dry, repetitive practice drills is not going to cut it. There are plenty of ways to spice up practice sessions, let's take conditioning training for our first example. You could have kids run laps around the field, over and over to build up their endurance, but that becomes stale very quickly. You'll probably get most of them to run a lap and a half before they start thinking about chasing butterflies or some such. A much more beneficial (and engaging) use of conditioning time would be to throw the soccer ball into the mix. 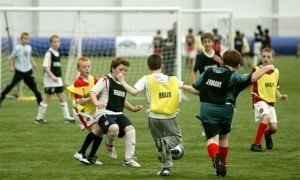 Have them traverse the field, but practice passing and dribbling at the same time. Alternate exercises and run passing grids to mix it up and keep them interested. Try doing short two-on-two drills and see who can cross the opponent's defensive line first, then switch-off to a series of quick sprints, and then back again. This way your kids can enjoy a combination of conditioning with skills training, teaching them the game and keeping them from losing sight of what they came out to do. Let's apply some of the same logic to strength training as well. It's important for kids to become stronger and faster, and you want them to be conscious of the benefits that strength training can provide them. However, you can't put a bunch of ten-year-olds in the gym and have them pump iron, and it'd be unreasonable to think they'd have any fun sitting around by themselves doing pushups or dips. To make strength training something youngsters can relate to; you have to make it a team activity, and you have to use equipment that makes the exercises stimulating. In this case, resistance bands are the way to go. Think about it. They are portable, so you won't need to lug around a bunch of heavy strength training gear. The kids can avoid going into the often intimidating and smelly weight room. You can stay outdoors and do the exercises anytime, and the motions will train major muscle groups while providing functional movement for your young athletes. A few favorites when it comes to team resistance band exercises are the zig-zag and ricochet, but you can also have kids mimic regular weight lifting exercises like push-ups, pull-ups, squats, squat-jumps, presses, and more. At some point, you'll have to teach them how to handle the ball, so dribbling drills will be a necessity. That doesn't mean they have to be boring, though. Small 3-4 man drills that reinforce the fundamentals while staying fun are essential to teaching the basics. Start with the cone drill. Don't act as if you forgot what the cone drill is. Set up four cones, have the children dribble the ball around the cones. The player that started the drill in the beginning goes to the end of the line, and the last player moves up to launch the sequence anew. Plenty of diagrams can be found online if you need a visual representation to help you out. Remember to encourage movement among your players and adjust the size of your practice area to fit the skill level of the players you have running the drill. Another great exercise is Red Light, Green Light. We all know Red Light, Green Light. Have one player designated as the light, and have your other players dribble towards him when he calls out the phrase, "Green Light". When the light calls "Red Light," all players should stop both their movement and the ball's movement, and any that don't must be sent back downfield. The first player to cross the plane where the light is standing wins, and becomes the new light. These are probably the most popular drills, but there are plenty of others out there to try. Make sure to look up "Running Bases", the "Team Dribbling Game", "Confined Dribbling", and "Doggies". load up on the last stride before kicking the ball. Teach your players to hit the ball with about 80% power as opposed to 100%, and watch their shots improve exponentially. You can even turn this exercise into a little game. Show them a video of the proper shot. Record them shooting and compare. Then have them correct their technique until it matches the right way to kick. Most kids have to see it believe it, so showing them a video of what they are doing wrong is not only a way to make them interested but displays to them visually the mistakes they might be making. Last, but certainly not least, everything that you do should reinforce the concept of teamwork. At this very critical stage in the young player's life, it is important for them to learn that we achieve the most by working together as one. The very best football players aren't the ones who just have standout abilities and technical skill; they are the ones who know how to work as a team and elevate everyone around them to do better. A player who is well rounded and works well with others is an asset both on and off the field, and one that everyone wants to be around. You can instill this ethic by making sure all of your players participate and attend practice sessions. Build relationships between teammates, encourage them to interact off the field and let them know that they can count on you and one another for guidance and support. Employing these methods, along with making practice fun, will help you build the next generation of young footballers, who will remember the lessons learned on the field and apply them to building a better future for themselves and those around them!